LOS ANGELES, Calif., Oct. 5, 2011—Scientists, educators and eco-adventurers are being offered the unprecedented opportunity to join a research expedition through the North Pacific Ocean littered with debris generated by the Japan tsunami of March 11, 2011. Rarely is such a monumental amount of material—tens of thousands of tons including cars, entire homes and boats—simultaneously thrust into the sea from a single location. 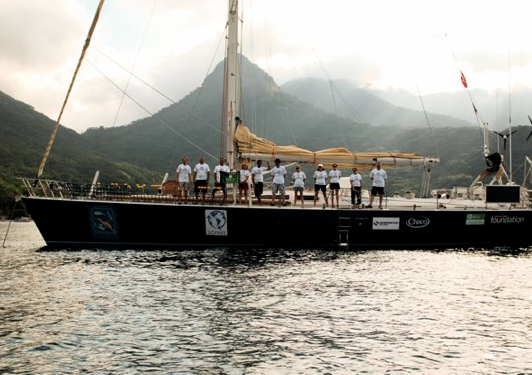 The 5 Gyres Institute and the Algalita Marine Research Foundation (Algalita) have organized this expedition in collaboration with Pangaea Explorations to offer a 7,000-mile, high-seas voyage aboard the “Sea Dragon” sailing vessel from May 1 through July 1, 2012. “We’ll be riding the same currents that are transporting cigarette lighters, bottle caps, children’s toys and all manner of other plastic pollution generated by the tsunami,” said expedition leader Marcus Eriksen, Executive Director and co-founder of the 5 Gyres Institute. The 2012 voyage is open to anyone 18-years and older, regardless of sailing experience. Participants will travel with four professional crewmembers and will be expected to earn their sea legs and rough hands by hauling in lines and hoisting sails. They also will conduct research side-by-side with scientists, whether operating a trawl or collecting and cataloging plastic marine pollution and sea life. Nine crew seats are available at a cost of $13,500 each for Leg 1 and $15,500 each for Leg 2. A portion of the fare is tax deductible and net proceeds will support Algalita and 5 Gyres’ cooperative research and educational outreach. This is the second eco-adventure conducted by Algalita. Its July 2011 voyage across the eastern North Pacific Gyre sold out. 5 Gyres has conducted seven research voyages across the five subtropical gyres, including the first expeditions to the three southern hemisphere gyres. Crewmembers included scientists, artists, journalists and environmentalists from around the world, such as Tim Silverwood of New South Wales. This gyre sample was taken during a July 2011 voyage across the North Pacific Gyre (Garbage Patch) by Algalita Marine Research Foundation. The sample includes micro-plastic bits as well as a toothbrush, two pen caps, a spray-bottle nozzle, and a small toy gorilla. Algalita and 5 Gyres, both nonprofit organizations, have been leaders in pioneering research and increasing global awareness of plastic marine pollution. Algalita’s founder, Captain Charles Moore, brought attention to the “Eastern Garbage Patch” in the North Pacific Gyre in 1999. 5 Gyres continues to monitor plastic marine pollution in the “garbage patches” found in all five subtropical gyres. Most of the plastic debris studied has been adrift for years, much of it broken down by the sun’s rays and ocean currents into small plastic particles. For all participation requirements, sponsorship opportunities and to register, contact Jeanne Gallagher: (562) 598-4889; opsadmin@algalita.org. About 5 Gyres Institute: 5 Gyres Institute is a nonprofit organization committed to meaningful change through research, education and community action. 5 Gyres disseminates its findings through lectures, publications and traveling exhibits, and raises awareness about plastic marine pollution through sailing expeditions across the world’s oceans. For information on upcoming expeditions and exhibitions around the globe: (323) 395-1843; info@5Gyres.org. About Algalita Marine Research Foundation: The Algalita Marine Research Foundation, a nonprofit organization based in Long Beach, CA, is dedicated to the protection of the marine environment and its watersheds through research, education, and restoration. Algalita conducts research and collaborative studies on the distribution, abundance and fate of marine plastic pollution and the potential harmful effects of plastics in the marine environment, including transference of toxins and their impact on human health; provides authoritative, educational findings to scientists, the general public, governmental agencies, and the private sector; collaborates with organizations working toward restoring the aquatic environment and ultimately eliminating plastic pollution. More information: (562) 598-4889; www.algalita.org. About Pangaea Explorations: Pangaea Explorations offers adventure sailing to actively strengthen the health of marine life through exploration, conservation and education work. Our mission is to inspire and develop a new generation of leaders in conservation science, communication, education, art and policy leadership. More information: www.panexplore.com.